I like that name a lot but I'm bound to think of Click and Clack's production staff. You know, the head of the working mother's department "Erasmus B. Dragon". Apparently, like his daughter Elizabeth, Henry was "wicked smahhht" as we say around here. No surprise. He was also very cunning. He is, of course, a Cancer (June 28). According to my Birthday Book, "cunning" is a trait amongst cancers. However, if our cunning goes unchecked, or we are aware of how persuasive we can be, very bad things can happen. I think Ann Boleyn would agree. And the Catholic church. And Katherine of Aragon. And Bloody Mary. 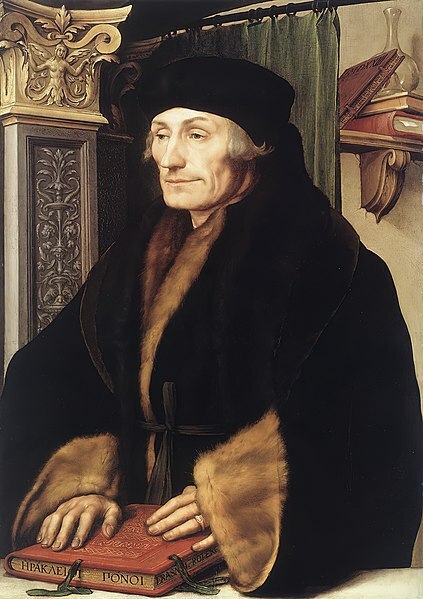 Humanism in the 1500s "described a curriculum comprising grammar, rhetoric, moral philosophy, poetry and history as studied via classical authors. Humanists mostly believed that, although God created the universe, it was humans that had developed and industrialized it. Beauty, a popular topic, was held to represent a deep inner virtue and value, and an essential element in the path towards God."